As promised, motivated by comments (5 inspiring souls did bother to comment and encourage me!) 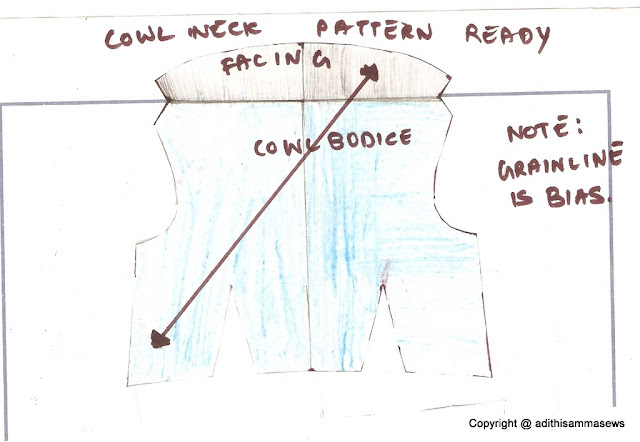 i hereby present the short tutorial i had drafted for Cowl Neck. Please try it on some muslin or cheap fabric, get your pattern fit tested and then try on expensive fabrics. In case of any doubts feel free to buzz me. Feedback and comments are highly appreciated. Also plan to open a flicker pool, in case you happen to use any of my tutorials, i would be happy to see how your creations turned out. Depending on the response for this tute, i plan to do some tutorials in future. Have a few ideas in mind, may be i shall have a poll and whichever gets your votes, will get featured. What say? 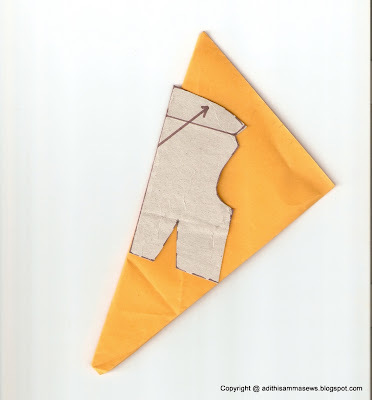 Place the pattern on bias grain of folded fabric. 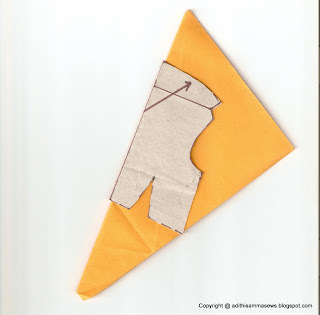 Yellow paper is to be assumed as fabric and the cowl neck pattern is placed on bias grain line on fold. 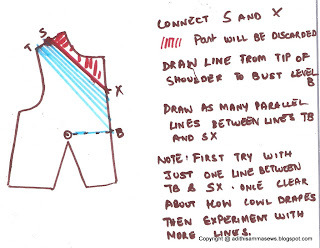 Important Note: Test fit this pattern and if you feel neck is gaping too much then try this adjustment slightly move the Cowl pattern placed on fabric outwards from Shoulder to Neck Depth till where you feel it is gaping. 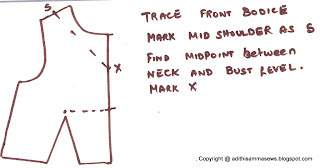 See the picture below where the pattern is slightly placed outside of fabric fold from Shoulder till a certain neck depth so that gaping can be cut out and the cowl will drape elegantly and modesty will also be maintained. Comments, Queries , brickbats are most welcome! good tute for cowl neck. work in progress. let u know the end result in a weeks time. I am certainly trying this out. What fabric do you suggest for this? Something flowy perhaps? Looking forward to your cowl neck top vidhya. Great tutorial! You keep the instructions simple and easy to follow. I did not realize you could put bias on fold! I will certainly be trying this. Looking forward to seeing more from you! This tutorial is awesome! I have struggled for several months to develop a good cowl pattern, and have not succeeded. I don't know why I didn't think of swiveling the elements from the arm hole upwards along the CF - I think I tried this early on, and the results were less than satisfactory, but I like your solution. Thanks so much for posting this! Thank you for ur tutorial. ur is tutorial is very easy and once more thanks for posting ur exprience. Thank you for the tutorial. It was so easy to follow. After scouring the internet I was so pleased to find yours. I was wondering if you ever posted a tutorial on sewing the cowl neck top? I just finished mine, but had hoped to reference yours to make sure I am doing it correctly (for future projects). I was also wondering if you had any suggestions on how to increase the cowl. I like where the neckline hits, but I'd like even more drape. I wasn't sure if I needed to lower my TB or SX line, or if I should move one of my slits up to the guideline. If you have any suggestions I'd appreciate it. Once I post my cowl neck on my blog I'll send you some pictures. Also I'm having a Top-toberfest shirt celebration on my blog this week. If you'd like to link up any of your shirts and tops I'd love to have you participate. The direct link to the link party is below. Thank you all. I am glad you found it to be useful. really ur site very very useful one. thanks for sharing this valuable patterns. one request mam i want gathering chudithar pant pattern, can u post it mam? hello! i have a question..,..i don't know if somebody had already asked that, but you know, english is not my mothertongue so reading all the comments would be really hard for me :) so..what i wanted to know is if i can put the S point closer to the neck or i if it MUST BE always in the middle of the shoulder....hope you can solve my question :) you're really clear and i love your blog especially this part with pattern, pictures with clear memos, it's everything easier this way! please, go on like this!! !you're really helpful to me.. 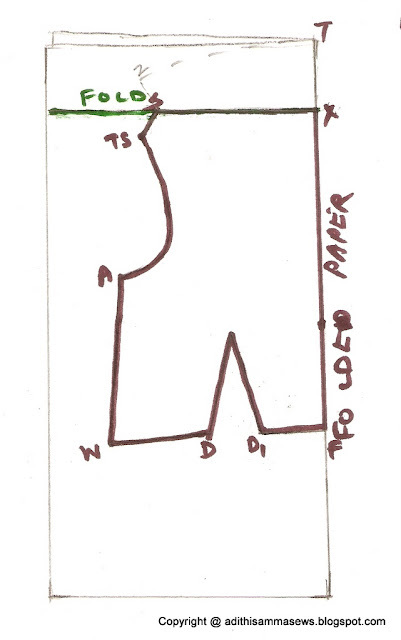 This draft is based on Basic bodice hence the midpoint of shoulder (which will be broad and up till close to the neck) will be S. If you are using a shift dress or any other top with narrow shoulder strip width then feel free to use even the High Position shoulder i.e, the shoulder point at the neck end as S. Hope this answers your question, Alexandra! Thanks Amsu. Will try to post Churidhaar pattern soon. You are absolutely right Alexandra! Try it out and get back with results. very nice draft and i will try for my kids defnetly adithi's amma!! thanks for the detailed tutorial for cowl neck.....i use to sew many kind of dresses for my kids including nighties and yet to post it on my blog, hope i will try this next project of mine!! Thanks Ramvino. Hope to see your finished cowl neck dress soon. You can subscribe to response to your comment by clicking on Subscribe by email link below. will do a mini-pic tute / video tute on nice ways to drape shawl soon and post the link here. Cowl when used with lining is bit tricky as may not get the same drape as with single layer of fabric. There's no harm trying though, but results may not be same as without lining. Please check the post of mine where i have used dupatta material for cowl and have normal top fabric to stitch the top, you can use your main fabric as such to stitch top and for cowl part alone use the sheer fabric. Strange, your page shows up having a red hue to it, what color is the primary color on your web site? I am new to your blog,seen cowl neck pattern which I searched for a long time,Thank u very much,will u please tell how to stitch it? Thanks Vicki, all the very best for your sewing expeditions! Thanks Uma, will do a stitching tutorial for cowl in the month of December! This is a good tutorial. I was looking to make this top for my daughter. Thanks a lot! How would you construct a cowl halter for a barbie? Would it work? Hi, I need a clarification, in step 3 why do we cut it? is it just to get the idea of how we need to cut the cloth y pulling it up a bit. .
Will give it a go - looks possible!